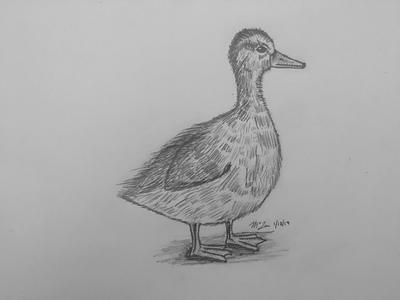 My last sketch was a female duck, so I figured I would give a duckling a try. The fluffier texture seemed like it would be a lot less difficult but was not without it’s challenges! The bill gave me some challenges to get the shape I wanted. Lots of erasing and redrawing. I would love to try ink, but I erase so much that I’m afraid! I think I’m going to attempt the male duck next.